Between every day activities and occasional high impact sports, almost anyone can suffer a foot or ankle injury. Our lower extremities bear the weight of our entire body and any sudden misstep can cause a significant injury. At Mid-Tennessee Bone and Joint, Dr. Randy Davidson is our foot and ankle specialist. He has over 25 years of experience in treating a variety of orthopedic conditions. According to Dr. Davidson, he routinely sees patients who are suffering from trauma or overuse injuries, while other cases are congenital or developmental in nature. The ankle is made up of three types of tissue: bones, ligaments, and tendons. Ligaments connect bone to bone, and tendons connect the muscles to bones which is important for movement. The foot and ankle have 28 bones, each of which can be fractured or injured in a variety of ways. Treatment is based on the bone that is broken and the alignment of the fracture. Many can be treated with bracing or casting while some require surgery. With a suspected fracture or sprain, you’ll experience pain and swelling. For these types of injuries, there’s a simple acronym to remember: R.I.C.E. That stands for Rest, Ice, Compression, and Elevation. After trying these techniques, you can slowly start to put more weight on your foot or ankle based on pain. If the pain and swelling haven’t improved in a few days, you should seek medical attention. Other than a fracture or sprain, there are many other reasons why someone might have foot pain. Plantar fasciitis is the most common cause of heel pain. 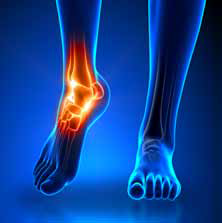 The pain is along the bottom of the heel and is worse when you first get up in the morning or with prolonged walking. Other sources of pain can include tendonitis, bunions, or nerve pain such as Morton’s neuroma. For every patient, Dr. Davidson creates an individualized treatment plan with the main goals of increasing function and decreasing pain. Typically, his first line of treatment will be a variety of nonsurgical methods, including the judicious use of injections. Other nonsurgical options include bracing, shoe modification or orthotics, anti-inflammatories, and occasionally physical therapy. The foot and ankle have 28 bones, each of which can be fractured or injured in a variety of ways. When the diagnosis calls for surgery, Dr. Davidson is highly experienced in performing a variety of procedures. His most common surgeries are bunion and hammertoe surgery, Achilles tendon repair and reconstruction, and ankle arthroscopy and ligament reconstruction. Arthroscopy is a less invasive form of surgery that allows the surgeon to evaluate the ankle by putting a small scope in the joint. It is used most often in young patients with intraarticular fractures or ligament injuries. For patients who have significant arthritis in the ankle, an emerging trend is to perform a total ankle replacement. In the past these patients had to have an ankle fusion which severely limited their motion. Dr. Davidson recently performed this surgery on a patient at MTBJ, Dennis Edwards of Pulaski, and his progress so far has been very encouraging. Instead of having to be in a cast for three months, he was able to transition from a cast to a brace after two weeks. Physical therapy is required to maximize the motion and function after this procedure. For now, fusions are still the best option for young patients or those with multiple medical problems. There are some important guidelines to remember after foot or ankle surgery. The first few weeks after surgery should be devoted to rest and recuperation. It may be helpful to have family members or friends on call to assist with most daily tasks, although the patient should be able to handle personal care. Because the foot and ankle are under significant stress when we bear weight, most procedures require some time with restricted weight bearing after your surgery, with or without immobilization. All procedures will involve some swelling after surgery, which is one of the main reasons patients have to wait a while before they can wear shoes again postoperatively. All procedures require some type of exercise program as part of the recovery process. Sometimes this is done in the home while in other cases formal physical therapy is required. An underwater treadmill is particularly helpful for foot and ankle patients because it allows exercising in a weight protected environment. Mid-Tennessee Bone and Joint offers this technology in our fully staffed physical therapy department. If coming here is inconvenient, we always work with our patients to ensure their physical therapy is scheduled at convenient locations and times. If you’re experiencing foot or ankle pain that keeps you from being active and enjoying life, don’t wait to get it checked out. Knowing what to expect with any injury or other condition is important, and our physicians are available to guide you in making your critical health related decisions. 11 Responses to "Treating Foot and Ankle Pain"
Thanks for your comment about how foot pain sometimes comes because of the shoes you use. I didn’t know that flip flops caused major problems. My mom is considering foot clinics because she has been some experiencing some pains in her feet and ankles. That’s interesting that Plantar fasciitis is the most common cause of heel pain. I play a lot of sports with my feet, including soccer, and last week after waking up I noticed that some pain along the bottom of my heel. It might be the time now for me to check out a foot and ankle doctor, because I feel like the pain is getting worse every day. I had been experiencing some ankle pains and I wanted to know where’s the best I could actually get checked. I didn’t know about the Plantar fasciitis, but most likely that’s the symptoms I’ve been experiencing. Thanks. I really like that you mentioned the R.I.C.E. method! Knowing a technique to try at home is great, especially since I tend to have a lot of pain in my feet after playing sports. Since I play basketball nearly every day, I’ve noticed it’s starting to affect my body, and I want to be able to stay in shape and play basketball while taking care of myself at the same time. Thanks for the tips-I’ll be sure to keep them in mind as I take precautions to maintain my health! I had no idea that bunions could also cause foot and ankle pain. It is important to remember that doing some research and understand what is causing your pain can help you find the best way to deal with it. Personally, I would also want to check with a doctor I trust in order to get the best references to the professionals that can help my foot and ankle pain. My fiance is looking into getting an ankle doctor for some issues that he has been having. He wants to know what to expect going to the doctor’s office. I will be sure to let him know that some procedures may require more formal physical therapy. I’m glad you mentioned all the different things that could be causing foot pain. I wonder if I have mild tendinitis because my feet tend to hurt after I walk a lot. Other than that, they are fine though. Thanks for the tips on how you can treat and deal with ankle pain. I agree that you should get professional help as soon as possible after getting an injury so it doesn’t get worse. My brother says he has been experiencing some foot pain and has been debating on seeing a foot doctor; I will be sure to share this with him. I was surprised to read that people will get a total ankle replacement if arthritis in the ankle is significant. My brother broke his ankle playing soccer, and he is still feeling pain from it even though it was 6 years ago. He has never been to an injury treatment center, but I think that it would help him a lot. I am going to recommend that he finds one in his area. I love what you said about devoting the first few weeks after surgery to rest and recuperation. Foot surgeries need to be performed by reputable podiatrists with proper certification. If I had any problems with my own feet, I would make sure to contact a podiatrist to see what treatment options are available.